Great that you are thinking Drysuits. This is one of the most personalized but also most valuable parts of a diver’s kit in the PNW. For this reason, I usually recommend that newly certified divers start with a used drysuit first. Once you know what you like and don’t like in a suit (much of it is preference rather than right or wrong), you can look at getting one exactly the way you want if the used one isn’t fitting the bill already. Drysuits are sort of like cars in that they depreciate quite a bit and there always seems to be someone wanting to part with one. So as Penopolypants advises, keep an eye on the classifieds here and on Craigslist for opportunities. A warm welcome to you and your daughters to our emerald waters and NWDC! Welcome to the board, and to the addiction! And how great is it that you have built-in dive buddies! 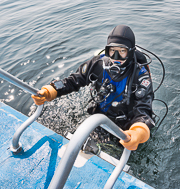 Drysuits will make your dives much more comfortable and enjoyable, especially in the winter, so your approach is sound. Feel free to join our weekly dives, or post in the dive planning section yourself. Also check out our classifieds section for gear, or post the gear central section if you have questions. Most of us LOVE to talk about gear. Many of us are also happy to let you try something if we have it, so you can avoid costly gear choices. My name is Doug and I recently passed my open water diver certification here in Seattle, along with my two daughters (15yo and 23yo.) We've got a couple of vacations to Hawaii planned this winter for warm water diving, but I am really excited about diving more locally (and other cold water locations,) too. I don't have my own equipment yet, but am hoping to put together some kit over this winter. First in order, though, is drysuit training for all three of us since my daughters don't have my natural insulation and froze during their certification dives. I appreciate all of the valuable information here on the forum and hope to be able to join some club dives.